All three authors, who are activists as well as writers and thinkers—emphasize how crucial this shift in perception is for our work, and how through it we can gain more effective direction and even hope. None of them glosses over awful realities or the unlikeliness of success. They share similar perspectives on what is wrong—the brokenness of our systems—and the need to realign our relationships within our ecological home. Lappe goes into more depth on the economic and political facets of our system failure, and focuses on political/structural/economic actions, while Macy/Johnstone emphasize the emotional costs of the failure and focus on individual and group work and spiritual practice as a basis for deep understanding and action. Both books reject the idea that human natures will never change. Macy/Johnstone say that life is never static. Lappe asserts that humans have many positive, as well as negative, qualities, and the kind of society we create can determine which aspects of our natures prevail. They differ somewhat on dealing with despair. 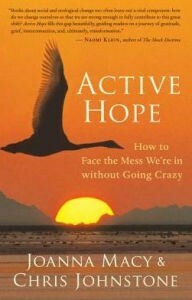 Lappe sees despair as a negative force that we can’t afford to give into. Macy and Johnstone talk about recognizing and transforming the despair. Active Hope is a detailed discussion of the spiral that is familiar to people who have taken part in Macy’s work; why it really is “work that reconnects,” and the importance of each aspect. She advocates experiencing the spiral over and over—from gratitude to honoring our pain for the world to seeing with new eyes to going forth and taking action. As a veteran of many group experiences of the spiral, the book didn’t hold a lot of surprises for me, but it deepened my understanding of its depths and power, especially what it means to see with new eyes. The book includes both group exercises and individual exercises that encourage readers to pause and think, and write personal responses to the questions that the book raises. Some of these I had done as part of a group process, but I found it well worth doing them again, and I sometimes surprised myself with what I wrote. It felt a bit like picking up an object, or hearing a piece of music, and perceiving it in a new and deeper way. While Macy’s earlier Coming Back to Life is the best source for detailed descriptions of group exercises and how to facilitate them, for a narrative about the power of each part of the spiral, and as an introduction to the Work that Reconnects, I’d choose Active Hope. And if, like me, you’re a veteran of this work, I think Active Hope will deepen your understanding and appreciation of the work. 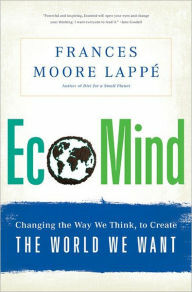 In Ecomind Lappe takes apart seven “thought traps” that get in the way of effective action, and turns them around using the lens of an ecomind. For example the thought trap that we’ve hit the limits of our finite earth is not a message that resonates with people who haven’t been part of the consumption party, and it is misleading because it doesn’t recognize how exceedingly wasteful we have been, or how much positive quality of life is non-material. Ecological thinking is not so much about more or less, but about alignment, about acting in harmony with the rest of the natural world. She would, for example, change the Transition Town motto from “carbon descent” to “carbon freedom,” finding ways to live better and carbon-free. Lappe urges us to look behind facile descriptions of problems. For example, we can tell overweight children to exercise more and eat less. We can also look at what’s behind the obesity epidemic, and among other causes see how profits are made in the food industry and decide to work on the problem through direct action. I didn’t agree with every one of Lappe’s points, but she is well worth arguing with, and she offers an economic and political perspective that complements Macy’s and Johnstone’s. Neither book soft-pedals the mess we’re in and the inevitability of disasters, and parts of both books are painful to read. Passive hope, which Macy and Johnstone define as a wish, is not the same as active hope, which is working toward the world you want to see, even if the odds of success are very small. Courage, for all three authors, is what we need to turn our new perspectives into action. Plus, I think, wise understanding, which these books provide.